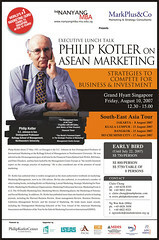 Today ‘heng heng’ (lucky blessed) I got a free ticket to attend an Executive Lunch Talk with Philip Kotler. He is supposedly the world’s No.1 Marketing guru, and believe or not he is now 76 years of age. Personally, I would never spend that kind of ‘scandalous’ amount just to listen and rub shoulders with a who’s who status person. And frankly, listening to Mr Kotler was more like sitting in a lecture class except of cos, this was in a hotel. Mr Kotler presented most of his points in an academic-like fashion or text-book style. And surprisely, almost half of the strategies and case studies he shared were taken from a book- Blue Ocean which was not authored by him. That was puzzling. These factors in building a company’s reputation can be similiarly used for one’s personal life. (1) Quality of products or services refers to our character- am I trustworthy and be relied on by others? (2) Innovative-ness refers to how my life is continually adding value to others- If Google or Apple were to close down, would they be missed by people? if I were to die, would I be sorely missed? (3) Financial soundness is equally critical in an individual’s life, in exhibiting stability in order to gain credibility. (4) Quality of Management is self-explanatory. If you can’t manage you life, don’t expect others to allow you to manage them. (5) Social responsibility is the need to be accountable to those around you and contribute to the betterment of your community. No man is an island. Therefore, I believe if we bear these factors in mind with our personal lives, we can build a attractive personal repution for Christ with those around us too. And in any case, building a reputable company begins with us (our personal lives) first as CEOs or bosses. Argh. I remembered his name. My marketing class in NUS uses his text book!